Am I eligible for 30 hours' free childcare? 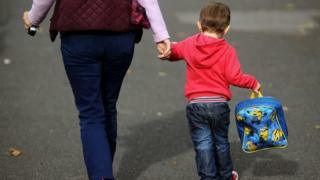 From September, working parents of three and four year olds in England will be entitled to 30 hours' free childcare a week. But how do you know if you are eligible and what is the process for applying? What is 30 hours' free childcare? The government is doubling the universal entitlement of 15 hours' free childcare, which is available for all three and four year olds. It is funded during term time only - so 38 weeks of the year - but parents can chose whether to use it as 30 hours per week during term time or 22.8 hours per week across 50 weeks of the year. Both parents must be working or the sole parent must be working in a lone-parent family. They must earn a minimum of the equivalent of 16 hours per week at the national living or minimum wage and less than £100,000 a year. If you are self-employed or on a zero hours-contract you are still eligible as long as you meet the earnings threshold. If one parent is not in paid employment you will not usually be eligible although there are exceptions for those who are on parental, maternity, paternity, adoption or sick leave. Once the government confirms your eligibility, the funding comes into effect the September, January or April following your child's third birthday. To qualify for the extra hours from next month, you must have applied by midnight on August 31. Cut off dates for the other school terms are: 31 December for the spring term (January) and 31 March for the summer term (April). Through the government's online childcare service. You can also apply by ringing the childcare service helpline on 0300 123 4097. You must make the application the term before you wish to start receiving the funding and you can apply up to 16 weeks before your child turns three. It you are eligible, you'll receive an 11-digit code which you then take to your childcare provider along with your national insurance number and child's date of birth. There will be a short grace period allowing parents to have a chance to find new employment. Any provider on Ofsted's Early Years Register, including childminders, day nurseries, playgroups, pre-schools and nurseries. You cannot use it with a nanny or an unregistered childminder. Does my childcare provider have to offer it? No. It is completely up to your provider as they are under no legal obligation to do so. Can I use more than one provider? Yes. You can split the funded hours between different providers, for example between a childminder and a session at pre-school. Why is my provider charging me a top-up fee? Government funding is meant to cover the delivery of early education and care only. This means the extra funding does not include food or cover the cost of additional services such as day trips, costs of drop-offs and pick-ups. Providers can therefore charge for things such as drinks, meals, nappies, wipes and trips out.